A cool cushion the Quirky Lady Cushion features a black velvet back drop with a grand lady with a floral headdress and cockatoo perched on her shoulder. 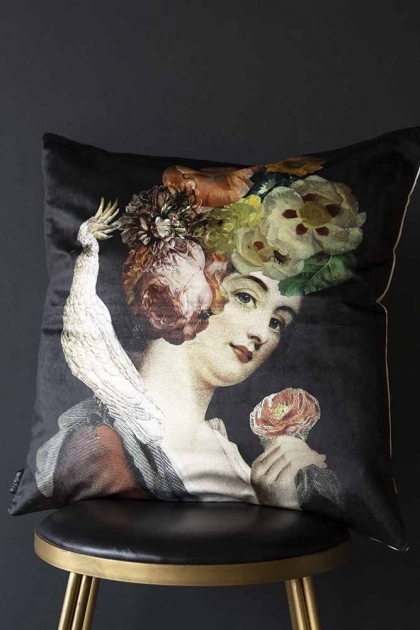 The Quirky Lady With Floral Headdress & Cockatoo Cushion measures 50cm x 50cm and is made from velour. We are seeing a lot of traditional canvas’ and art with a modern quirky twist and this eclectic cushion is a tribute to this interior design trend. We think that the reason why is that people are feeling braver with their interior choices and want to add more wit and humour to the home. And, we fully support this! The bolder you can be with your interior design the more uniquely personal it will be. So don’t be afraid to experiment! 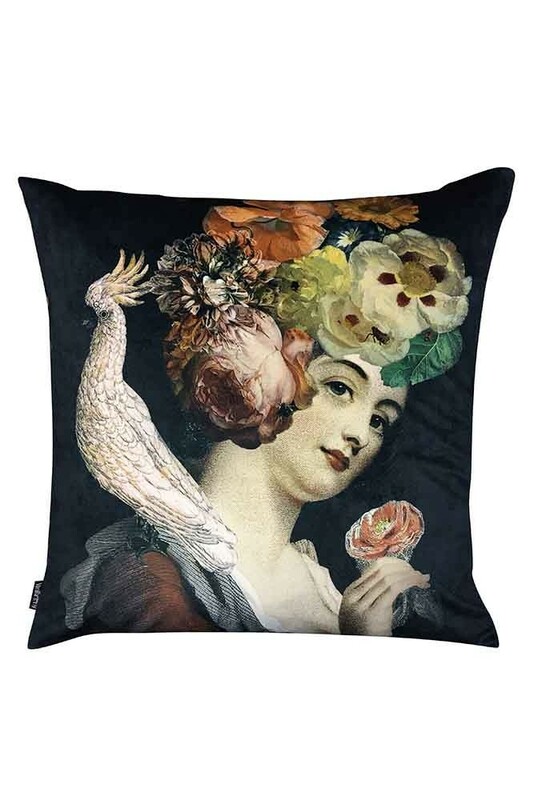 However, if you want to start out small then decorative cushions like this Quirky Lady Floral Headdress Cushion is the perfect way to start. “Why?” We hear you ask. Because decorative accessories are an inexpensive way to get a little wild with your décor and can easily be changed and switched up if you don’t like it. The trick to styling cushions on your beds, sofas and armchairs is layering. Using one colour cushions as the base, embellish and accessorise your cushion display with quirky cushions like this Quirky Lady With Floral Headdress & Cockatoo Black Velvet Cushion for an eclectic décor edge.